Synthetic peptide within Mouse BRG1 aa 200-300. The exact sequence is proprietary. This antibody was developed as part of a collaboration between Epitomics, the National Cancer Institute's Center for Cancer Research and the lab of Gordon Hager. View antibodies from NCI Center for Cancer Research Collaboration. Our Abpromise guarantee covers the use of ab110641 in the following tested applications. WB 1/10000 - 1/50000. Predicted molecular weight: 185 kDa.Can be blocked with BRG1 peptide (ab241115). IHC-P 1/100 - 1/250. Antigen retrieval is recommended. Heat up to 98 °C, below boiling, and then let cool for 10-20 min. Lanes 1 - 4: Merged signal (red and green). Green - ab110641 observed at 185 kDa. Red - loading control, ab18058, observed at 124 kDa. ab110641 was shown to specifically react with BRG1 in wild-type HAP1 cells. No band was observed when BRG1 knockout samples were used. Wild-type and BRG1 knockout samples were subjected to SDS-PAGE, ab110641 and ab18058 (loading control to Vinculin) were both diluted 1/10,000 and incubated overnight at 4°C. Blots were developed with Goat anti-Rabbit IgG H&L (IRDye® 800CW) preadsorbed (ab216773) and Goat anti-Mouse IgG H&L (IRDye® 680RD) preadsorbed (ab216776) secondary antibodies at 1/10,000 dilution for 1hr at room temperature before imaging. BAF47 and BRG1 occupancy at cyclin D1 promoter. 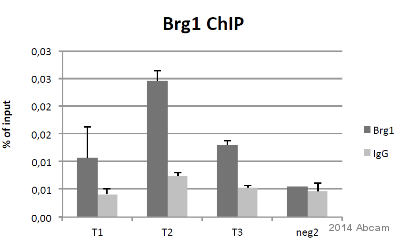 ChIP-qPCR analyses of BAF47 and BRG1 in myoblast in proliferating C2C12 cells and at 24 h of differentiation. The immunoprecipitated material was quantified by qPCR, and results are expressed as fold enrichment of the % of Input of BAF47 or BRG1 ChIP over % of Input of the IgG average. Data are represented as mean ±SEM, n = 3. BRG1 was percipiteted using ab110641 overnight at 4°C. ab110641 staining BRG1 in HeLa cells. The cells were fixed with 4% formaldehyde (10min), permeabilized with 0.1% Triton X-100 for 5 minutes and then blocked with 1% BSA/10% normal goat serum/0.3M glycine in 0.1% PBS-Tween for 1h. The cells were then incubated with ab110641 at 1/500 dilution and ab195889 (Mouse monoclonal [DM1A] to alpha Tubulin - Microtubule Marker (Alexa Fluor® 594)) at 1/250 dilution overnight at +4°C, followed by a further incubation at room temperature for 1h with ab150081 (Goat polyclonal Secondary Antibody to Rabbit IgG - H&L (Alexa Fluor® 488)) at 2 μg/ml (shown in green). Nuclear DNA was labelled in blue with DAPI. ChIP analysis using ab110641 binding BRG1 in mouse bone marrow derived macrophages. Cells were cross-linked for 10 minutes with formaldehyde. Samples were incubated with primary antibody for 16 hours at 4°C. Protein binding was detected using real-time PCR. ab110641 at 1/100 dilution staining BRG1 in Human testis tissue by Immunohistochemistry, Paraffin-embedded tissue. Flow Cytometry analysis of HeLa (human cervix adenocarcinoma) cells labeling BRG1 with purified ab110641 at 1/200 dilution(10µg/ml) (red). Cells were fixed with 4% paraformaldehyde and permeabilised with 90% methanol. A Goat anti rabbit IgG (Alexa Fluor® 488)(1/2000 dilution) was used as the secondary antibody. Rabbit monoclonal IgG (Black) was used as the isotype control, cells without incubation with primary antibody and secondary antibody (Blue) were used as the unlabeled control. ab110641 staining BRG1 in wild-type HAP1 cells (top panel) and BRG1 knockout HAP1 cells (bottom panel). The cells were fixed with 4% formaldehyde (10min), permeabilized with 0.1% Triton X-100 for 5 minutes and then blocked with 1% BSA/10% normal goat serum/0.3M glycine in 0.1% PBS-Tween for 1h. The cells were then incubated with ab110641 at 1/500 dilution and ab195889 at 1/250 dilution (shown in pseudocolour red) overnight at +4°C, followed by a further incubation at room temperature for 1h with a goat secondary antibody to Rabbit IgG (Alexa Fluor® 488) (ab150081) at 2 μg/ml (shown in green). Nuclear DNA was labelled in blue with DAPI. ab110641 at 1/100 dilution staining BRG1 in Human kidney tissue by Immunohistochemistry, Paraffin-embedded tissue. Publishing research using ab110641? Please let us know so that we can cite the reference in this datasheet. Thank you . Please add one same antibody from deifferent lot . I am sorry this product did not perform as stated on the datasheet and for the inconvenience this has caused. As requested, I have issued a free of charge replacement with the order number 1231536. Here is the reply from customer. I have tried with all the possible alterations even with the washing steps . We have been trying with alternatives for the last 6 months and the results still remains same.This made us suspect that the secondary antibody is faulty and is showing non specific flourochrome blotches. I am sorry hear about the disappointing results. 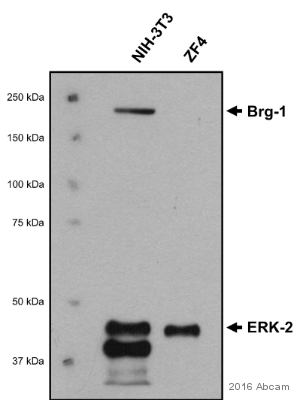 If customer have purchased the secondary antibody from Abcam (ab6718) and if the problem is due to secondary antibody then I am happy to replace it for this customer. Please let me know the order number for secondary antibody. - What was the cell line used? e.g. human liver cancer cell line. - Do you see difference in no primary control? Were the cells red in colour as seen with primary antibody? - Do you think the problem is due to ab6718 or ab110641. - What was the storage condition of antibody? - Did you change any step when doing repeat experiment? I am considering getting a batch of the Ab mentioned, for PF IHC-f.
would you suggest, if I did obtain a batch. At this time we have no data regarding the use of ab110641 in frozen sections. It certainly may be useful in this application, as many antibodies that are useful in IHC-P can also be used in frozen sections. There are similar patterns of red blotches even when there is no primary antibody used.The pattern remains the same when used with the required primary antibody but are non-specific in nature. The antibody was stored at -20. This is strange, if the red cells are seen even without primary antibody then the problem is either due to secondary antibody or due to protocol. I have checked the protocol and I find no problem with it other than the wash step which I assume is 3 washes of 5 minutes. You may need to try again, following the correct ICC/IF protocol steps. Please let me know if the results do not improve.